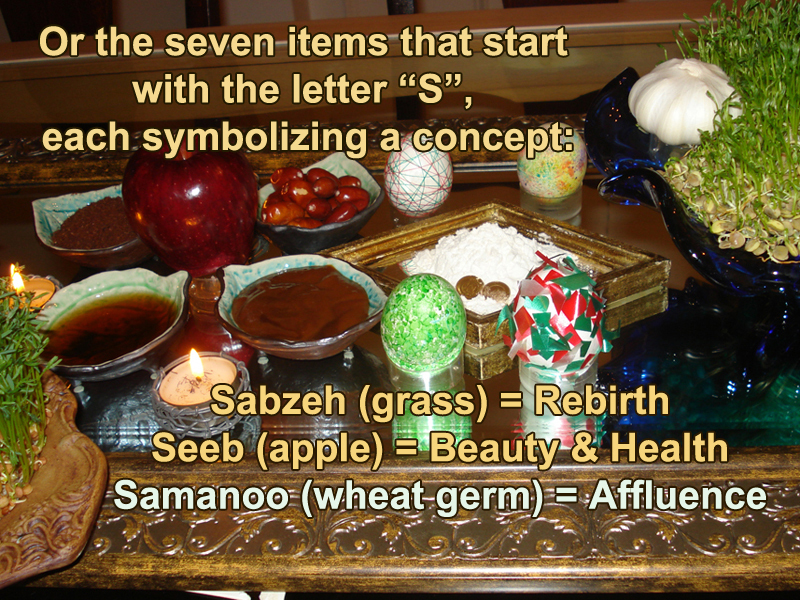 No element of Norooz, however, could be fully appreciated without being put in its proper context! So, first, here you go again, my few introductory words coming from a passionately held belief in Spring, Norooz and all the hope and inspiration that come with it. The first day of Spring or Norooz (also spelled Norouz, Noruz, Nawrooz, etc.) which means “new day” is a public Holiday in 15 countries and celebrated by over 187 million people of Persian, Indo-Iranian and other origins in these countries as well as by millions of immigrants in western countries. 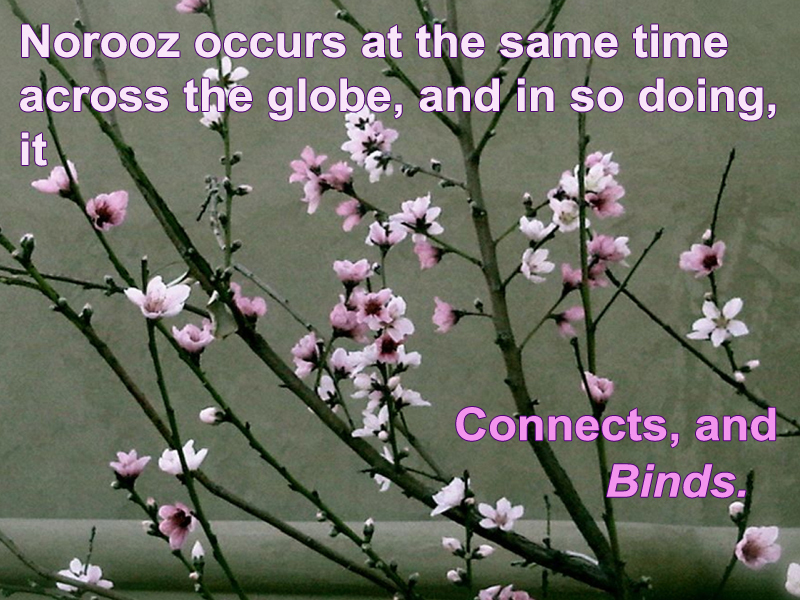 Norooz also makes the beginning of the official calendar (only in Iran and Afghanistan); It coincides with the Vernal Equinox, this Spring at 21 March 2015 at 2:15 AM Iran time. In Iran, Norooz remains the most cherished tradition observed and honored by peoples of different ethnic, religious and cultural backgrounds. We have an extremely rich body of art and literature associated with Spring and Norooz. Past and present contemporary poems about renewal, happiness, humanity, love and always always about HOPE. For many Iranians inside and outside the country Norooz is closely tied to their national identity, representing the most ancient Persian tradition which has survived so many adversaries over the course of centuries. Preparation for Norooz starts weeks in advance with spring cleaning, shopping of new clothing, growing platters of wheat and cress, painting eggs, and making LOTS of Norooz-specific delicacies, sweets and foods. Upcoming shortly!! After spending almost a quarter of a century outside Iran, I continue to hold Norooz dear and close to my heart, preparing for it weeks in advance, decorating my Norooz table and sitting around it at the exact moment of the turn of the season and the year- even though my calendar now is not Persian, and even though everything outside my window tells me that the Montreal harsh and long winter is far from over on March 21th! That is partly due to the fact that over the past few years, Norooz has become much more “accessible” for Iranian diaspora thanks to the technology on one hand, and to the politics of multiculturalism on the other. For example, there was a time when we used to have trouble finding hyacinth at this time of the year. Now, we have Norooz Bazaar in Montreal. We also have two-hour BBC or VOA internet program where we can sit around our Norooz cyber table with millions of other Iranian expatriates around the world and break in to tears when the New Year is announced with the joyous sound of timpani and trumpets. With Norooz so much close to home I seem to have no excuse NOT to try my hand at making the traditional Norooz sweets this year. 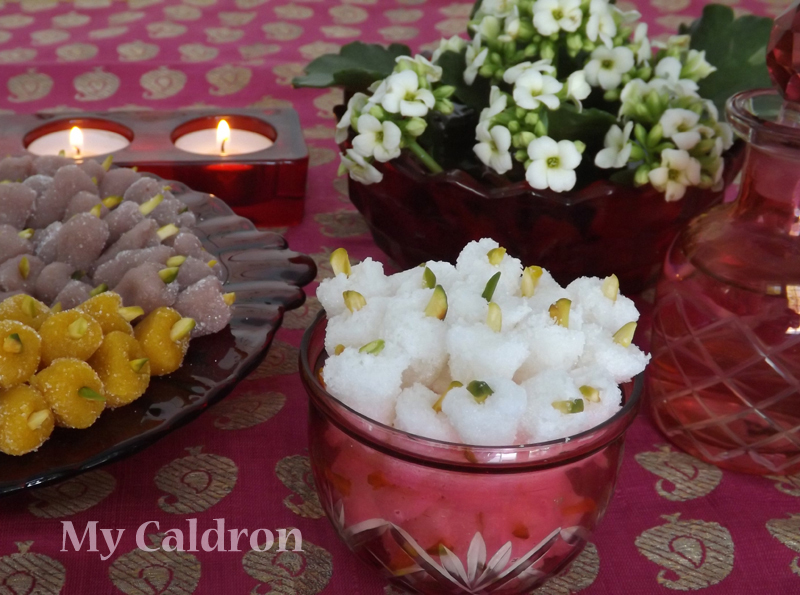 Yep, even though a beginner in cake and sweet baking, I decided to make one of the Norooz-related sweets as a part of my collaboration with the Persian Food Bloggers Norooz roundup. 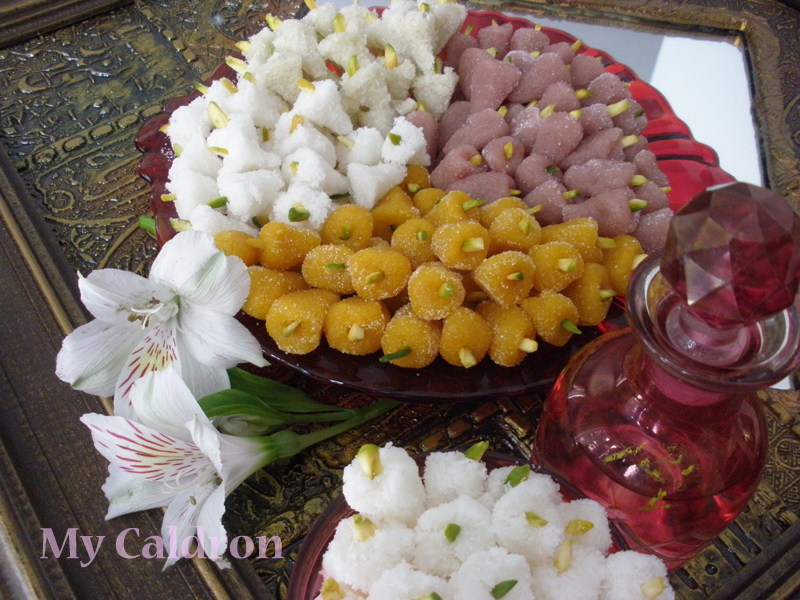 Toot is probably the simplest and easiest type of sweet made mainly for Norooz occasion. The sweet does not require baking and contains only a few ingredients: icing sugar, regular white sugar, rosewater, and ground almond (ground coconuts could be used too). The plain almond toot is the most common type but both variations could also be made in colors. Having said that, I am not a fan of using food colors in my cooking. 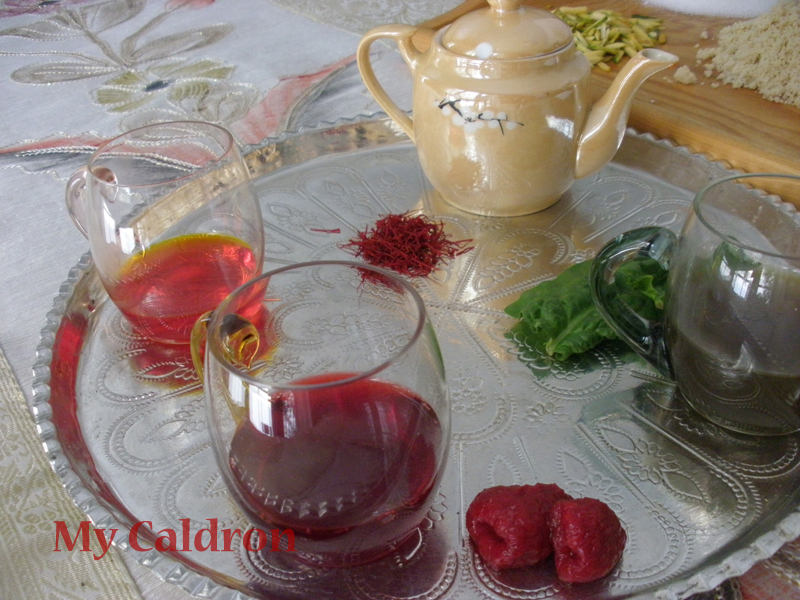 So for this recipe, I tried extracting different colors from saffron, raspberry and spinach for my toot. The experiment turned quite fun and successful! Let us start by extracting some colors out of our natural products. 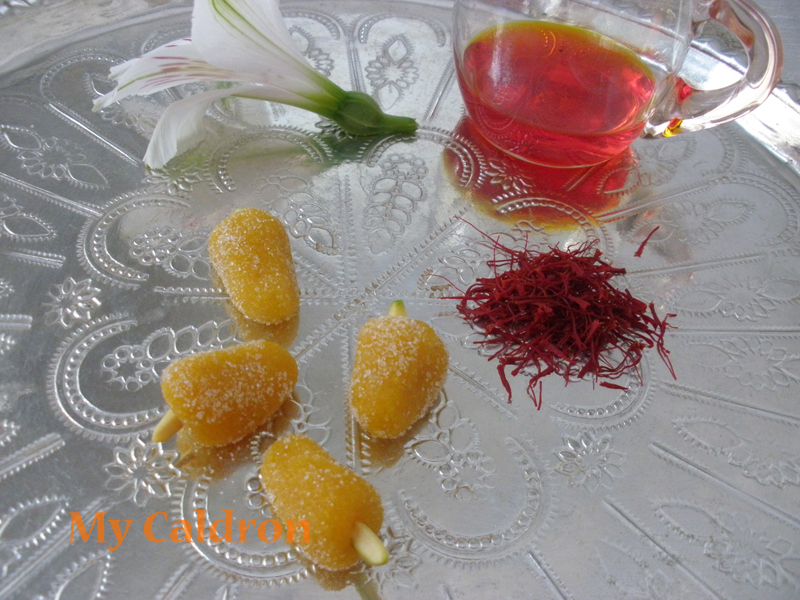 Saffron: If you do not own a mini kettle, use a small sauce pan to bring to boil about ¼ cup of water. Add finely ground saffron to the pot and cover till saffron releases color and aroma. We need 1 tbsp. for our color orange. Raspberry: Place the raspberries in a small pot. Add 1 tbsp. water and cover the lid over medium heat. After 10 minutes, reduce the heat to minimum and simmer until you get a reddish juice out of the raspberries. Separate the raspberries to be later used for Danish Pastry or jam. We need 3 tbsp. of the juice for our red color in toot. Spinach: Place washed and drained spinach in a pot, cover the lid and simmer for 15 minutes or until the vegetable juice is released. Pound cooked spinach and squeeze through colander. Separate the juice; you can mix the vegetable with yogurt and a touch of garlic powder, salt and black pepper for a delicious side-dish called “boorani”. Keep the juice for Toot; we need about 3 tbsp. to make green toot. 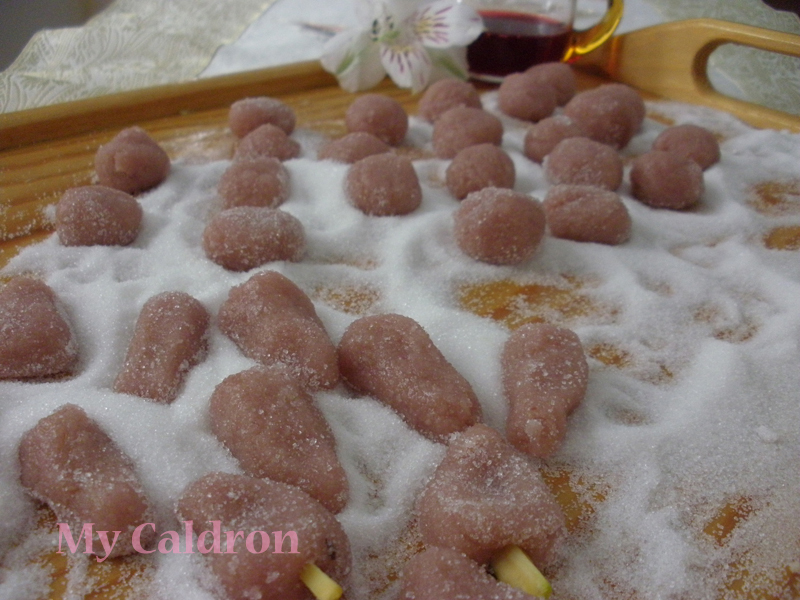 To make Almond Toot: In a bowl, combine ground almond and icing sugar using the back of a fork or your fingers. Gradually, add the rosewater and mix the ingredients into a sticky semi-soft paste. Divide the paste into two and set aside the first half in a covered container. Add 1 tbsp. saffron to the second half of the paste and make a soft paste (add more rosewater if necessary) You need the paste to be soft enough to form small balls. 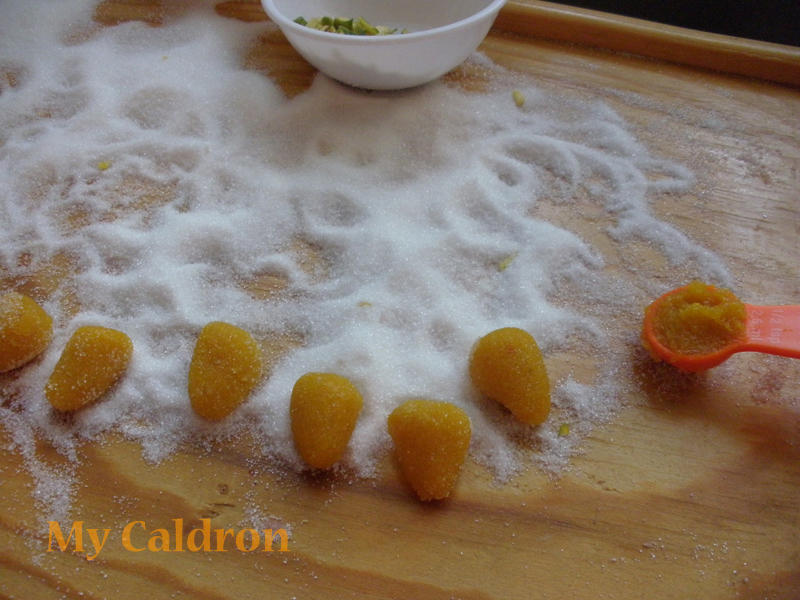 Cover the surface of a platter with sugar. Take a small piece from your big ball of the paste and roll into small Mulberry shaped bites. I used a 1/2 teaspoon to make them in equal size. Dip each toot in the sugar, covering all sides. Finally, Place a silvered pistachio on top of each Toot. Make sure to keep toot in a sealed jar as they would get dry quickly when exposed. Now start working with the other half of your paste – the one you set aside. Add 2-3 tbsp. of raspberry juice to make the paste soft enough to be rolled, while having and fairly reddish color to it. Follow the rest of the procedure as above. – Rolling ground coconuts mixture into Toots is a bit more difficult as the particles are more coarse and do not hold as easily. Yet with some patience it is doable. – Because ground coconuts are pure white, they make very pretty plain toot. So, if you want to make white toot, without any color juice, increase the amount of rosewater from 2 tbsp. to 5 tbsp. – Also, because colors show much better when mixed with white, I used spinach juice to make slightly green coconut toot; it tasted different and interesting! I wish you all a happy spring and a life full of “new days”. Happy Norooz! What an interesting post! Very informative. I love your tuts in three colors. Thank you for the lovely presentation. Happy Norooz to you and yours! Thanks so much for dropping by and for your kind words. 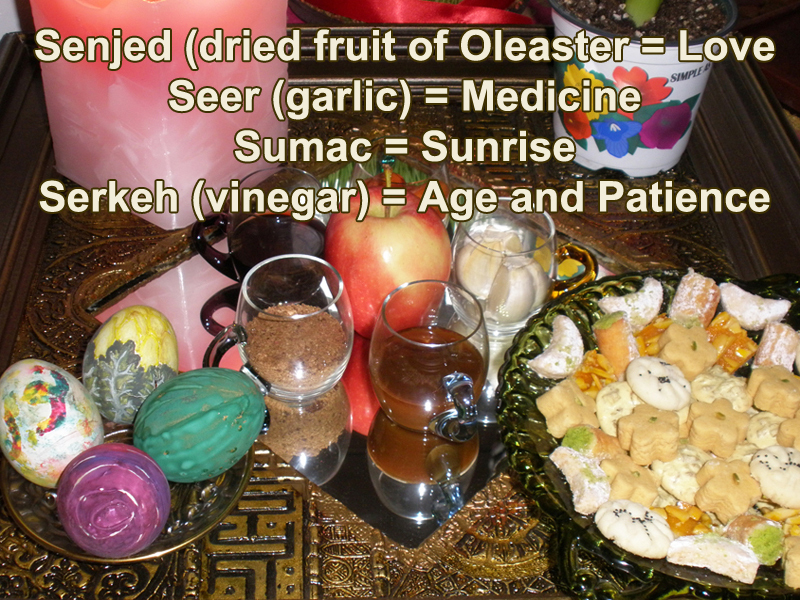 Have a wonderful Persian New Year! Love this dish. Also LOVE the all natural food coloring! I always avoid food coloring, but this is a great alternative. Toots are so tasty and light. Well done! So beautiful and delicate. I have never had this, but it sounds like something I know I will love! Happy Nowruz! To you too azizam; delighted to know your blog and wonderful recipes now. I love the natural colouring/flavouring. I didn’t know about the spinach & raspberry. I guess you could use any other fruit and/or vegetable with some color intensity. I love that you use natural coloring! So much more in the spirit of nature, and fresh, new beginnings. What is it about getting teary eyed right at new year? Often, they’re tears of mixed emotions! lovely toot and a lovely post! Thank you for your kind and lovely comment Naz joonam!